By Larry Geddes - This should be the last jig I ever need. It is not only fully adjustable over a wide range, but is extremely robust in its construction. The surface has been ground flat to less than .001" overall. The middle arm with a hole at both ends can be reversed for either 1/8" or 3/16" guide posts. The wheelbase and guide lead adjustment range covers the whole spectrum from small 1/32 cars to large 1/24 cars. The jig is also quite heavy, so I won't be chasing it all over the bench with my soldering iron. Thanks for letting me share this project with your readers! 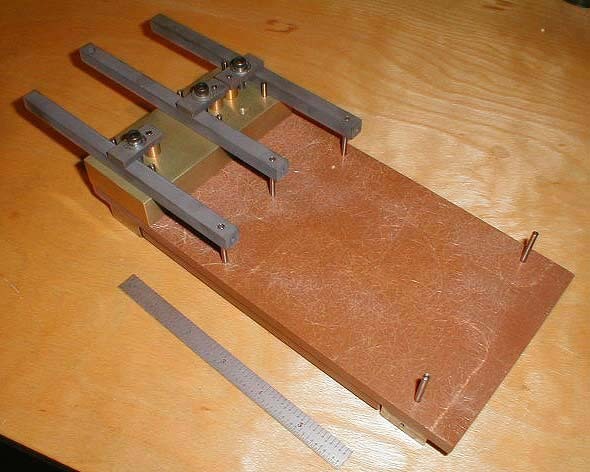 Above: Diagram of Larry Geddes' new jig. 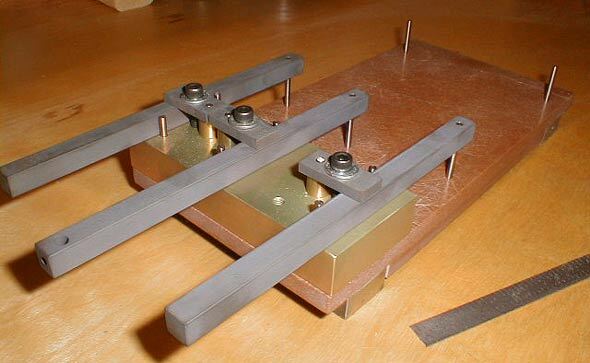 Scratchbuilders are invited to send in pictures and comments about their own chassis jigs and soldering blocks.